Hello! I'm going to keep an ongoing log of my research and experiences. I'm officially throwing my hat into the ring after this experience, which lit a fire under me! I've also started a Facebook page, but I'm really bad at navigating facebook! Date: November 14, 2018 Weather: Cloudy but 50's, decent Time: 11:30 - approximately 4pm Location: Cottage Lake reservoir/lake, Oregon What happened: I was walking my dog at the reservoir because I wanted to get out of the house and into the woods, but no one would go with me. So, I went on a walk at a popular lake at an unpopular time, when it was likely to be nearly deserted, aka November. I walked only approximately 1/2 mile along the gravel and mud portion of the beach which was exposed because the lake gets drained a lot each winter in anticipation of the winter rains. I saw an animal print in the mud, and took a picture. Then I started paying attention to what was going on in the mud at my feet... A whole mess of prints. At first, I thought "What terrible parents to let their kids run around in this mess!" . But then I thought, "wait, it's November! And it was near or below freezing last night" and "there's broken beer bottles and fish hooks all over". Who would let their kids really do this? Looking closely at the prints, there seemed to be three sizes and they didn't look exactly like typical child prints. I'm a preschool teacher - i know what kid prints look like, it's a very popular art project with little ones. So, I kept looking and started to get excited. I measured some against my pen. When I had a couple dozen, I walked my dog (who could have cared less) back to the car. I had both cell phone service and internet, hallelujah! I wanted to call a local researcher that i met in October, but I didn't have his number. 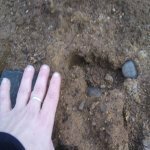 So I got on popular bigfooters websites and started emailing them, asking for referrals to local researchers. Then, I thought of a way to reach the person is met and eventually got through to him 15 minutes later. We spoke, I sent him pictures and he sent out a friend with bigfooting experience. "D" and I spent the next 2 hours taking photographs, following tracks and trying to make sense of what we were looking at. At 4pm, I was cold and muddy and it was getting dusky, so we called it a day and left. I'm very grateful for the support of this researcher and his equally cool friend. Follow Up: I was so excited that I only slept a few hours, lol. I woke my teenage son up extra early and we were at the lake at 6:45am. It was still completely dark and very foggy. The park road also didn't open until 8am, so I did not want to trespass. No way was i getting out of the truck in the dark and fog with my kid. While we were busy deciding what to do, off in the distance we could see a vehicle's lights and some flashlights on the beach area. After a moment, the lights turned off, which kinda freaked me out. We left and went home. At noon, I got a text from the researcher telling me that "D" tried to cast the price with some friends, but was turned away by Forest Service guys who said the park was closed indefinitely due to mud. Fyi, autocorrect is going to be the death of me. Oh my...I apologize in advance for odd words here and there! I'll try to catch them, but every time I edit, it adds new ones! Ugh, and it's Cottage Grove Lake. Not just cottage lake. Grrr.